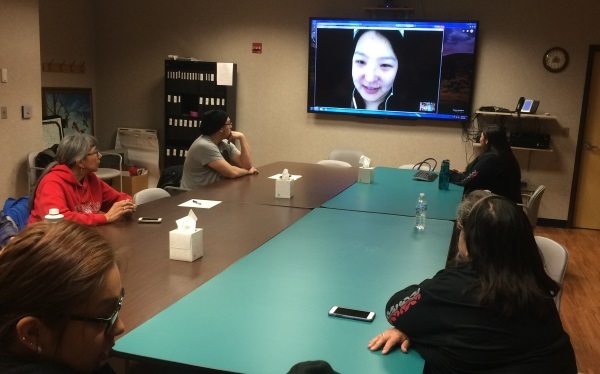 Twelve students at the Hoocak Academy celebrated their successful completion of an online course last month, following several months of hard work and dedication to learning the Ho-Chunk language. They would become the first class of Online Pathway 1 graduates. The 12-week course consisted of eight units that the students could access at their own convenience, each exposing them to a different topic of conversation within the language. Academy instructor Jerod Stacy facilitated the course. Prior to the course, many of the students had never spoken in Ho-Chunk, the instructor said. Yet by the end of it, they all had an understanding of basic vocabulary and sentence structure. According to Stacy, that knowledge could prove instrumental in reviving the tribe’s language. For a long time, many parents were unable to take a language class, due to busy schedules. Their situation convinced the Language Division to start offering their curriculum in an online format. Program Manager Angelica Greendeer said the course is like a dream come true for her staff. She said that, because of the success they had with the Online Pathway 1 program, her division plans to offer a follow-up course later in the year. The course could be online as soon as this summer, she said. Anyone interested in taking a language class should contact the Ho-Chunk Language Division.